I got through 12 minutes of my 45 minute DVD. That was all I could do. I was falling all over the place, sweating profusely, and confused. But believe it or not, I did it again. Every Wednesday, I made myself try the same DVD. I got over my first hurdle: I got all the way through it. And not well, mind you: I was still falling all over the place, stopping to rest when I shouldn’t, taking the easy modifications and making them easier. But pretty soon, I found myself wanting to do yoga more than once a week. I liked flexing and using all of those muscles I have that otherwise lie dormant. I liked the feeling of strength I got from all the Chaturangas. 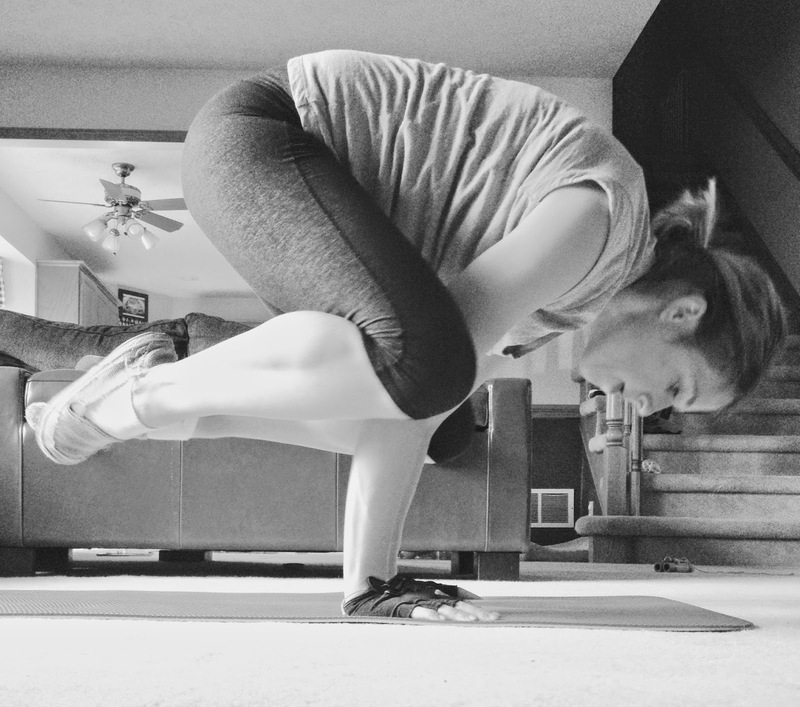 I was running too, but running did something different for me than yoga: running was my sweat therapy, but with yoga, I found myself folding deeper into stretches and being able to move in new ways and that transformation was addicting. I got a couple more DVDs and started adding those in: doing each DVD once a week so bringing my yoga up to three to five times a week. Yoga is the practice of constantly losing and regaining your balance, and I find that parallel to my daily life beautiful. People always talk about the mind benefits of yoga, and although I have never done any meditating or humming of any sort, I have noticed that yoga clears my irrational emotions, centers me. If I am in a bad mood, I know yoga will calm me down, chill me out, and balance me again. Once Steve and I were in the middle of a fight and I went to the basement, did a yoga DVD, then came back upstairs and apologized. Then today, about a year after that first day I tried and hated yoga, I was able to lift my body off the ground using only my hands. This is as close to levitating as I get, people, and damn right I felt like a Superhero. I think yoga is here to stay. When you create balance through a practice like yoga or any kind of discipline—whether it’s running or knitting—whatever it is that puts you in the zone where you’re truly focused, that’s where you can let that wandering stuff go so that you can truly be present and listen to things instead of listening to that negative self-talk.